When I try to open the mint menu, it's elevated from the bottom mate panel somewhat. It should be seamless against the panel without any space. If you type text in the search box, it will reset to its proper position. If you click the menu after doing this, it will also appear to be normal. If you click it any more, it will go back to having a gap. I've attached an image showing this. This from what I've tested only seems to affect this plugin, and not the regular mate menu. Xfce has a similar situation. 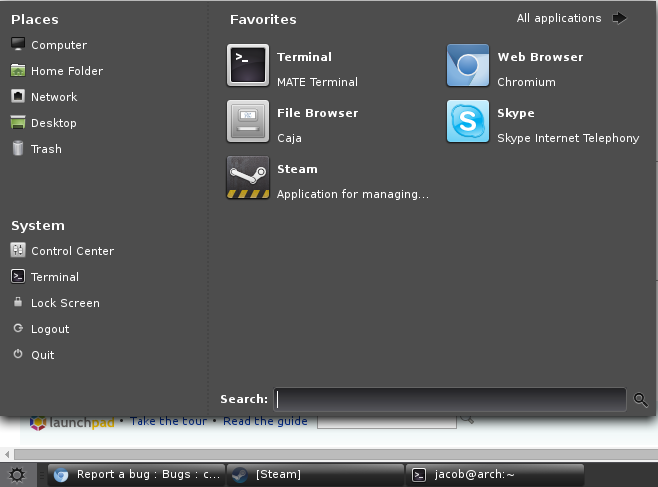 Xfce's normal menu is fine, but the quite popular Whisker Menu for Xfce elevates like you describe. 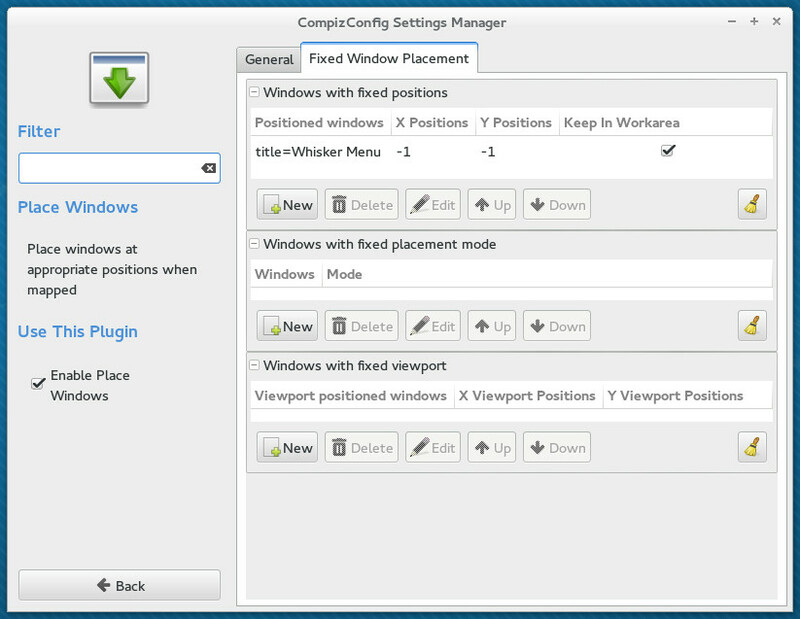 The settings as shown fixes it no matter the position of the Xfce panel. Sorry i forgot to mention: The issue doesn't occur at all (and doesn't require out above workaround) when the Xfce4-panel with the Whisker Menu button is at the top of the screen, it only occurs when it's at the bottom. Ah thank you, though is this patch available for compiz on non-manjaro systems (i.e. vanilla arch)? However, compiz-manjaro's patch is only addressing the problem for Xfce's Whisker Menu, it won't help Mintmenu, but you can easily fix it for yourself without needing any patching, the patch above only changes defaults (i.e. changes settings you can get to CCSM anyway). Attached is what gets set, you can adapt it for Mintmenu. It seems to be a general problem with bottom placed panels. Out of interest, I tried running Compiz alongside KDE Plasma 5 and I noticed that the launcher menu there was also offset. I've added a very brief section about this to the Arch Wiki. Same issue in Ubuntu MATE 15.04 with mate-menu (mintMenu fork) at the bottom panel. Same workaround - disable Place Windows plugin to get rid of the issue. Forgot to add that it's also been reported about mintMenu in Mint 17.1. Disabling Place Windows doesn't work for the Xfce datetime plugin though. I think this is a general problem with the way Compiz handles bottom panel popout windows. Out of interest Monsta, does the Whisker Menu fix work for mintmenu if the x and y positions are the lowest possible (-32768, -32768 on my machine) instead of -1, -1 ? Unfortunately, no. The result is the same as with [-1, -1] - as I described above. What's interesting is that MATE's Clock Applet isn't affected by this issue. When you click on it, it always shows the calendar window where it should be - close to the panel. Very cool workaround - tick "do not reserve space on egdes"
Bad suggestion. Windows place beside the panel . Is there posibility in compiz to add screen margins? @Yanpas where is that option? Ah yes I see it. That does indeed work but has the disadvantage of allow windows underneath the panel - hence your suggestion of the small transparent panel. New solution: "title=Whisker Menu" exclusion in compiz settings. It didn't worked for the 1st time, when I edited /usr/share/compiz/place.xml it began to work. Attaching my new file. I found those lines from compiz-manjaro. Solution for date and time plugin: "title=wrapper-1.0". X and Y you should set yourself depending on your screen. The attachment "only for xfce" seems to be a patch. If it isn't, please remove the "patch" flag from the attachment, remove the "patch" tag, and if you are a member of the ~ubuntu-reviewers, unsubscribe the team. "Solution for date and time plugin: "title=wrapper-1.0". X and Y you should set yourself depending on your screen." Yes, this works for me. Thanks. In my case, my screen is 1377x768 so I set a position of (1100, 586) which forces the calendar into the right place. Ok I think I understand the problem. It seems to be to do with Window decoration. In Emerald you have the ability to adjust the height of the titlebar. I noticed that the taller you made titlebar, the higher the Whisker Menu and the datetime calender were elevated. Likewise, making the titlebar less tall reduced the elevation. Disabling the window decoration plugin completely eliminated the elevation. My conclusion is that Compiz needs to be told that windows of type panel cannot be decorated under any circumstances. Tried excluding all windows from window decoration but it didn't fix the problem. Only disabling the decor plugin or killing the running decorator, be it gtk-window-decorator or emerald, 'fixed' the problem. But definitely something to do with the decor plugin. Just found I've reported the same issue, but also include a fix. $ dconf write /org/compiz/profiles/mint/plugins/winrules/size-matches "['class=MintMenu.py', 'class=MateMenu.py']"
$ dconf write /org/compiz/profiles/mint/plugins/winrules/size-height-values "[0, 0]"
$ dconf write /org/compiz/profiles/mint/plugins/winrules/size-width-values "[0, 0]"
b) Fails: Alternatively changing the system-wide settings like above for Ubuntu MATE -- but in /etc/compizconfig/mint.ini -- did not work in my case. Thanks to David Black and Martin Wimpress. Full confirmation for the fix in LM 17.3 MATE inluding case b) from above. Further, all second values where for testing only and not for real application (should have been called 'class=foo.py'). Thanks. Forgot to say - in Mint 17.3.